February saw the grand reopening of the People’s Palace to the public with eight exciting days of films, exhibitions and performances. The week of festivities was opened by an “Intergenerational Tea Dance”, an afternoon for all ages, including performing dancers, dance classes, lots of tea and cake. As part of the supporting programme and suiting the occasion, G.Hack presented Sound Mapping London Tea Houses to the interested public. Again, we would like to thank all members, participants and dancers for the lovely and inspiring afternoon as well as the organising team of the event for their help and support! The summer has flown by so quickly and if you have been around town during August and September you might have spotted the G.Hack troops Ilze, Kavin, Alice, Nic, Sam, Sara and myself armed with audio recorders, headphones, video cameras, iPhones and digital cameras having a cup of tea at some of the 100 favourite London Tea Houses across the 33 London boroughs. It’s all been a part of gathering content for the G.Hack’s new interactive installation, commissioned by MzTEK to be shown at Chi-TEK Tea Party at the V&A, during Digital Design Weekend on Saturday 24 & Sunday 25 September 2011. The brief was to take a teapot and use technology to modify/hack/enhance it. 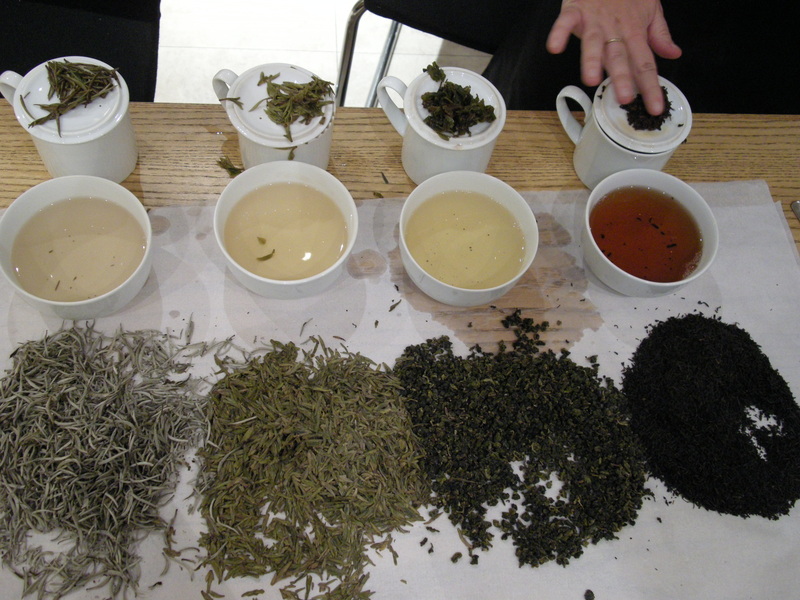 Somewhere during the brainstorming process we decided to take another route and instead of hacking into a teapot make an interactive tabletop installation that would allow V&A Tea Party visitors to navigate London through its contemporary tea culture. 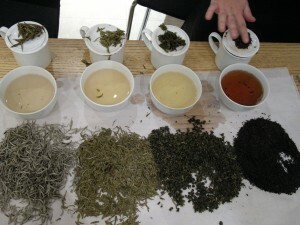 Hence the Sound Mapping London Tea Houses installation was born! Extensive lists of tea houses across 33 boroughs were complied by our project leader and all around super gal Ilze and having secured initial funding for the built of the installation we went on to figure out what other equipment we might need in order to make it all work. We found out that Antonella made a type of Reactable to do some tangible interaction testing last year, so we asked her to tell us a bit about the technology behind it. Reactable, a tangible modular synthesizer first developed at Music Technology Group (MTG), has set the standards for tangible multi-touch applications. It uses tracking system reacTIVision, which is an open source, cross-platform computer vision framework for tracking of fiducial markers attached onto physical objects, as well as multi-touch finger tracking. As the surface of the first teapot we wanted to use in the installation was smaller than the size of fiducial marker, we instead decided to wire 3 infrared LED’s together to make a trackable ‘blob’. 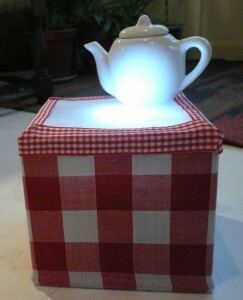 We than bought a georgeous glass teapot and placed the IR LED’s right at the bottom of it. 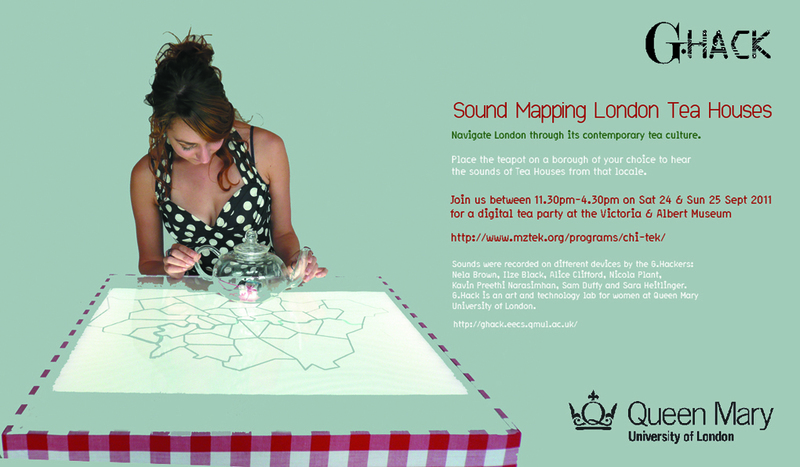 Alice constructed the map of London boroughs in Illustrator, than exported into Processing, which, using a camera with Infrared lens reads the teapot’s position, changes the colour of that borough to RED and sends the message to MaxMsp to play the corresponding tea house soundscape through a pair of external speakers. Simple and fun !!! and edit a short video of how it all works. Twinings Tea Museum - Tea is 'out' expect the unexpected ! 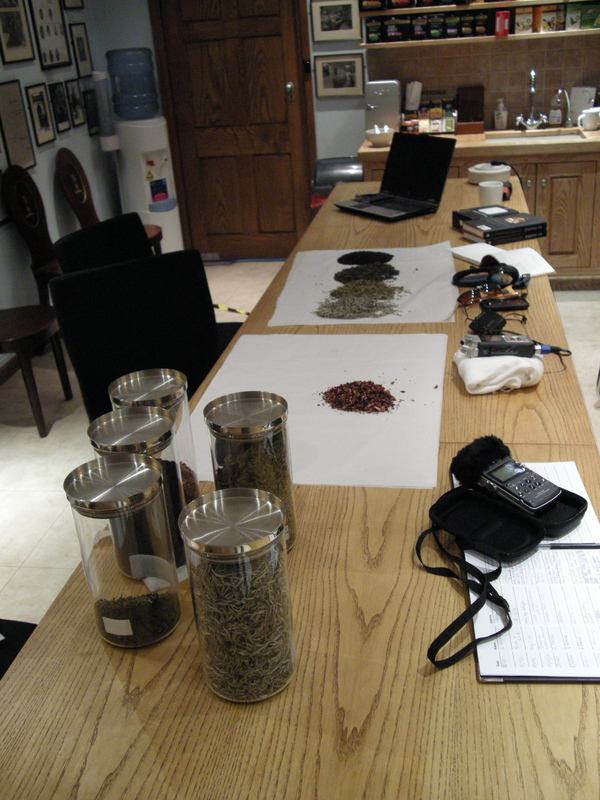 I have an early start tomorrow (a cup of tea is waiting for me at the Deli Teahouse in Havering) so I must go to bed, but will be back soon with more sound, photos and videos of the whole process and of course the Tea Party at the V&A !! !